Gia Heejin An, a lyric Coloratura Soprano, was born in South Korea. Ms. An came to U.S.A in 1996 at the age of 17. She graduated with Bachelor degree in Voice Performance from Temple University and Master Degree in Voice Performance and Opera from New England Conservatory of Music. Ms. An studied voice with Dr. Philip Cho and Carol Habor and has performed with many organizations as a guest soloist in U.S.A. and also in South Korea. She performed 2 years in a row as a soloist in “Laudate Dominum”, Mozart in her early undergraduate years and later she expanded her choral solo experience by performing as a guest soloist for “Kyrie” (Stravinsky), “Maginificat” (John Rutter), “Stabat Mater” (Rossini), and so on. Her operatic leading roles of "Dialogue and Camelites", "Patience", "La Clemenza di Tito", "Lakme" are highly acclaimed and also performed the roles of "Hansel and Gretel", "Gianni Schichi", "Don Giovanni", "Summer and Smoke", "Portrait of Manon". A second winner of the Pi Kappa Lambda Voice Competition, Ms. An is pursuing her musical career as a recital soloist for French Mélodie and German lieder. This is her 4th personal annual concert opening in MA this year. A native of South Korea, Joo Hye Kim, received her Bachelor of Music in piano performance from Ewha Womans University in Korea, and Master of Music and Doctor of Musical Arts in piano performance from the Conservatory of Music and Dance at University of Missouri – Kansas City. At age sixteen, she was the featured soloist of the New Seoul Philharmonic Orchestra. During her studies, she won the MMTA Honors Audition and the Concerto Competition of the Philharmonia of Greater Kansas City, performing with the orchestra. While at the UMKC Conservatory, she also studied organ and harpsichord, and received Graduate Teaching Assistantship in Opera Accompanying. Dr. Kim has taught Applied Piano as an Adjunct Professor at Rockhurst University (Kansas City, MO) and Metropolitan Community College – Blue River (MO). 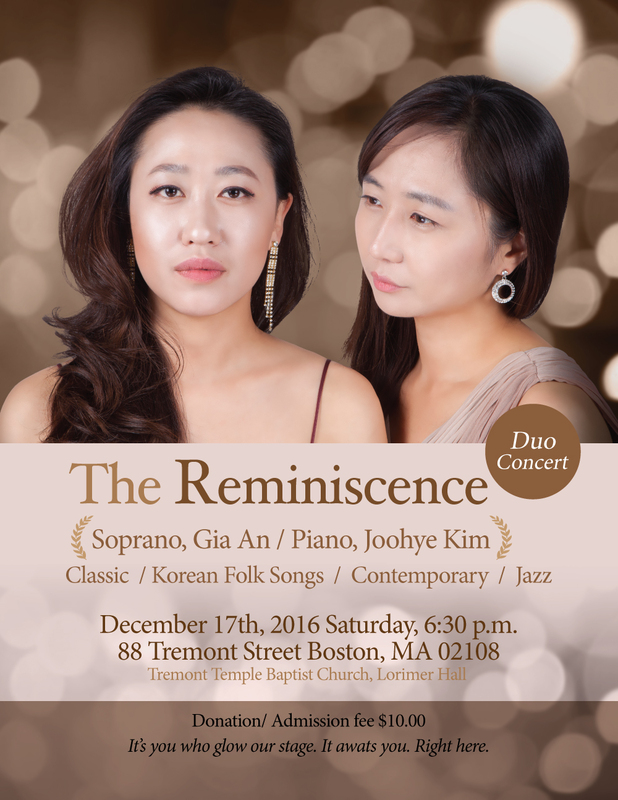 A sought-after chamber musician and collaborative pianist, she actively performs in recitals and concerts with instrumentalists and vocalists. She recently finished the Master of Divinity degree at Gordon-Conwell Theological Seminary and is currently the music coordinator, organist, and director of education at Tremont Temple Baptist Church in Boston, MA.